Mildred is a cannibal Butcher who invades you in Blighttown. After you kill her Black Phantom form, you'll be able to summon her as a phantom to help fight Chaos Witch Quelaag. As an invading Dark Spirit. 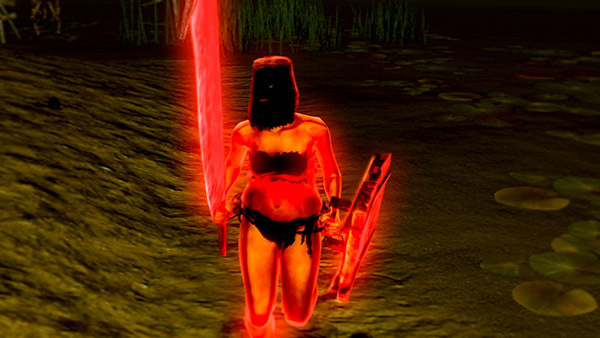 Her invasion can be triggered by walking out to the right from the second bonfire in the poison swamp. As a summonable phantom. Her summon sign is in front of Chaos Witch Quelaag's boss fog. Black Phantoms will only spawn if the player is in human form and the area boss has not been defeated. This means that defeating a boss before being invaded by a particular NPC Black Phantom will forever deny that Black Phantom from appearing in that area on the current playthrough. She takes only 20% fire damage. This can make her an useful ally against Quelaag. All her attacks are pretty slow due to the size of her weapon and can be easily dodged. So wait for her to charge up her attacks, get behind her and do as much damage as possible. She staggers pretty easily with the right weapon. With enough stamina, one could end this fight fast. Be wary of moving into the poison and of mosquitoes moving in to attack. Convenient fighting ground Reach the bonfire just before Quelaag's lair as undead and regain your human form. Stay in the room with the bonfire, Mildred will invade you if you just step outside and wait a few seconds. Go back into the tunnel and the mosquitos will not follow you because they haven't seen you. Mildred will enter the room to fight you, you will have the advantage of room to move without getting poisoned by the swamp or bitten by the mosquitos. If this doesn't work out you will at least have died in spot where it is easy to collect your bloodstain. Sometimes Mildred can be stuck right after the fog gate in Quelaag's boss room and will roll around doing absolutely nothing useful for the remainder of the boss fight. If this happens, try drawing Quelaag towards her. With luck, the boss will aggro her and she will leave the gate to assist you as usual.